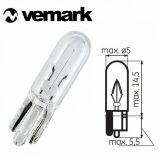 Dashboard car bulb, 1.2W, 12VDC Dashboard Car lamp with wattage 1.2W, voltage 12VDC and PVC base. 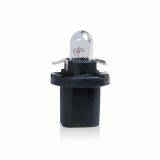 Dashboard car bulb, B8.5D, 1.2W, 12VDC Dashboard Car lamp with wattage 1.2W, voltage 12VDC and base B8.5d. 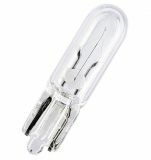 Miniature auto lamp 14 V 80 mA T1 3/4 W1,2W Miniature car bulb Т1, voltage 14 V and current 80 mA. 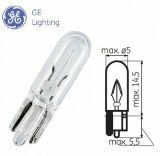 Automotive Filament Lamp W2W, 12VDC, 2W, W2x4.6d Automotive Filament Lamp W2W with supply voltage 12 VDC, power consumption 2 W and cap type W2x4.6d. 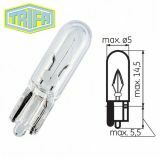 Automotive Filament Lamp, W1,2W, W2x4,6d, 12 VDC, 1.2 W, yellow Car Filament Lamp, W1,2W, W2x4,6d, 12 VDC, 1.2 W.